COMBINE coffee, evaporated milk and sugar in blender container. Blend until smooth. Pour over ice in glasses. Serve immediately. 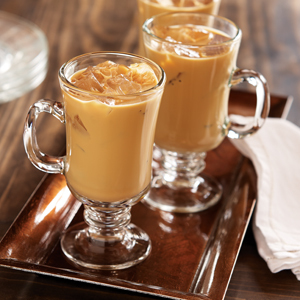 ICED CINNAMON LATTE: Substitute 1 cup Folgers Cinnamon Swirl Flavored Coffee, brewed strong* for French Vanilla. *To make strong brewed coffee: Measure 6 tablespoons French Vanilla or Cinnamon Swirl ground coffee and 1 1/2 cups cold water into a drip coffeemaker. Brew according to manufacturer's directions. Serving Size 1/6, Calories Per Serving 120, Total Fat 4.5g, Calories From Fat 40g, Saturated Fat 3g, Trans Fat 0g, Polyunsaturated Fat 0g, Monounsaturated Fat 1.5g, Cholesterol 20mg, Sodium 70mg, Carbohydrates 17g, Dietary Fiber 0g, Sugar 17g, Protein 4g;Percent Daily Value*: Vitamin A 2%, Calcium 15%, Vitamin C 2%, Iron 0%.